A campy, science-fiction actor and a North Korean war refugee have little in common, but they both personify life’s greatest struggles in the work of fiction-writer Paul Yoon and poet Tracy K. Smith. The two writers explored man’s fear of isolation and of the unknown at the Writers Here and Now reading March 26. 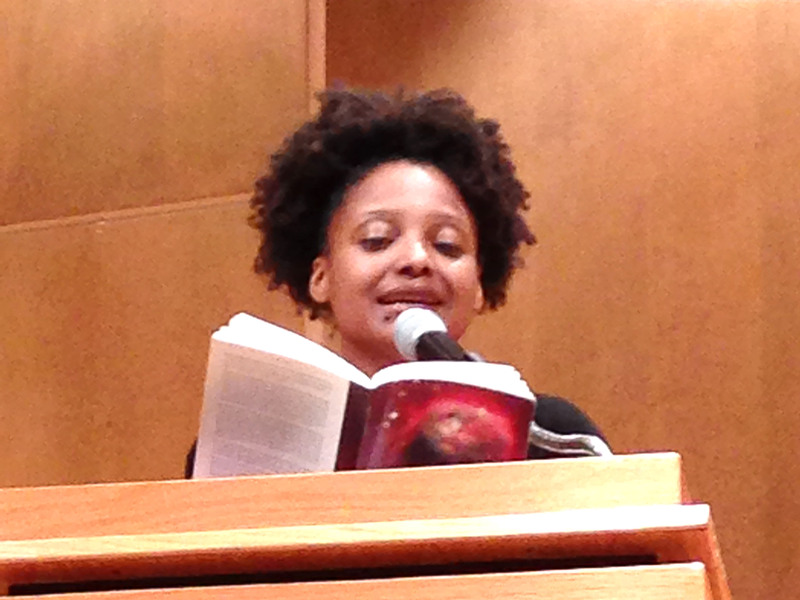 Morgan Fecto/Bloc Reporter~Science-fiction poet Tracy K. Smith reads an excerpt from her book “Life on Mars” at Writers Here and Now on March 26. The genre that inspired Smith is “kitschy in a very delightful way,” said the poet. Her poems weave fantastical elements with universal themes. “Hero, survivor, God’s right hand man, I know he sees the blank/surface of the moon where I see a language built from brick and bone,” read Smith from “My God, It’s Full of Stars,” a poem about life’s precariousness, living on another planet and Charlton Heston. “It felt engaging even though you can’t imagine half the stuff in our world,” said Ian Sloan, a sophomore criminal justice major and poetry student. While Smith questions life from otherworldly plains, Yoon examines life by grounding it in reality and history. “His story to me seemed very authentic,” said Sloan. Yoon, a recipient of the Five Under 35 award from the National Book Foundation, read an excerpt from his novel “Snow Hunters.” The novel examines disenfranchisement with the story of a man who flees to Brazil after fighting in the Korean War. Morgan Fecto/Bloc Reporter~Fiction writer Paul Yoon immerses the audience into his book “The Snow Hunters,” which follows a North Korean prisoner of war. Greta Boller, a senior English major and poetry student, had another view of Yoon’s piece. “I wasn’t captivated by his plot or characters, and the transitions through time were hard to follow,” Boller said. Although their work had similar themes, the writers read with different voices. 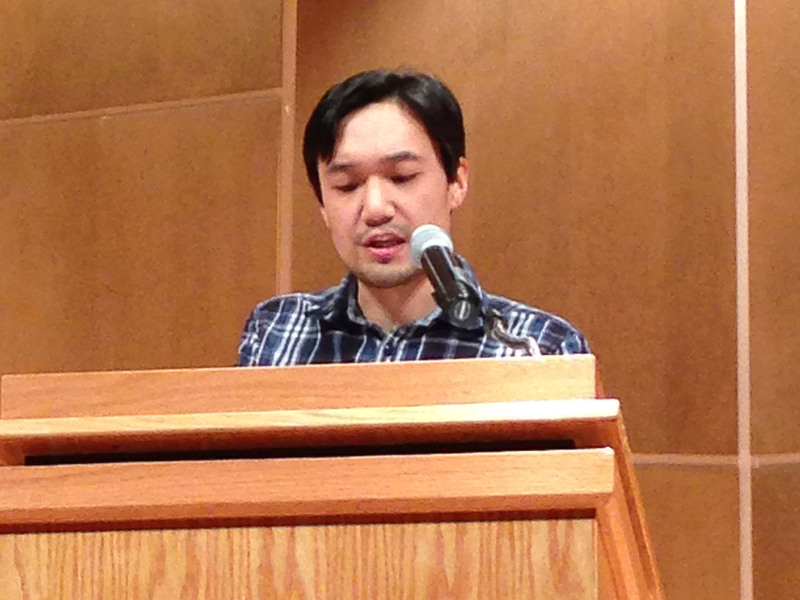 Yoon’s piece was idiomatic, with short, paratactical sentences that mirrored his matter-of-fact reading. “He read everything very flatly. There was no cadence or inflection in his voice and I found myself struggling to stay focused,” Boller said. Smith was warmer and more humorous during her reading. “I really liked her style. Her voice is very soothing. She also hovered on the interesting adjectives that she used,” Yano said. Sloan said Smith’s reading style created a sense of intimacy with her audience. When Smith wrapped up the reading, she barely spoke her last line before the audience roared with applause. “Smith was one of the best Writers Here and Now readers I’ve heard thus far,” Boller said. As the applause died down, the lights in Ulrich Hall shut off completely, amusing and befuddling the crowd. It was a fitting close to an evening of ethereal examination and journeys into the unknown.